Doctors continue to learn after they graduate. 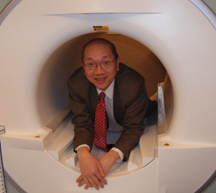 Dr. Chao worked with Mike Zlatkin who developed MRI imaging of the shoulder. A good radiologist makes a huge difference. 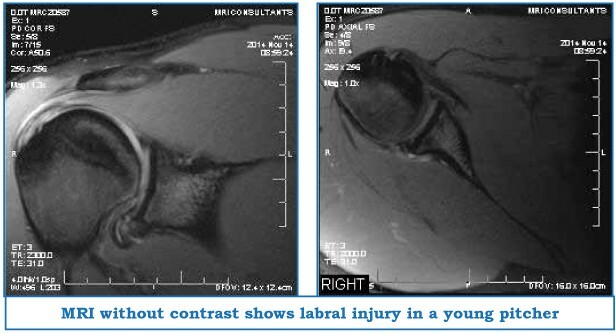 The added detail we see using 3T MRI matters for imaging of the labrum. We had a 60 year old patient with shoulder pain and a negative x-ray. The routine x-ray is a very poor test for imaging the shoulder. It is always done but it misses almost EVERYTHING that might cause shoulder pain. The doctor wanted to inject steroid without MRI imaging. This is a mistake. If you use steroids without knowing if the patient has a tear – you may make matters worse. An MRI of the shoulder in all patients older than 50 is necessary because of the high incidence of rotator cuff tears and disease. Tears smaller than 1 cm can be repaired with an arthroscopic acromioplasty (day surgery). If you wait till the tear is larger it will often require extensive surgery. If the tear is retracted most surgeons will not operate and you lose the use of your shoulder. This is why imaging with 3T MRI earlier is ALWAYS better. 3T MRI scanners had more detail and are used for most sports teams. It costs the same as the slower inferior 1.5T MRI which most doctors think is adequate. At 1.5T the scanner cannot see a labral tear without an expensive and painful procedure called an MR arthrogram. At 3T we can see the tears without any contrast. So we save up to 1000 dollars with our extra detail. If there is any question we can use IV contrast and see the labral tear of your hip or shoulder joint or knee without an invasive procedure. This is called an indirect arthrogram. Our OPEN MRI scanner is the widest and most spacious, and least claustrophobic MRI in the world. We also offer IV sedation ($50) in case you can’t tolerate the study. BLADE software actually compensates for movement (of your shoulder or hip) and allows us to get clearer pictures. Most doctors don’t know this can make the difference in seeing a tear. Some patients who come to our OPEN MRI have been to 4 other scanners before finding out that ours is the only one that they can fit into. We have had the ultimate 32-channel 3T MRI scanner for two years in Lewes and a 8-channel 3T scanner in Newark for 8 years. Still most physicians do not know of the difference and the need for higher resolution and contrast. I only ask that people (or doctors) call and ask me why 3T MRI is better. We have the most experience at 3T. MRI Consultants remains committed to providing the very best imaging and patient care possible. Also, given the complications of medical insurance, our office has an Out-of-Pocket price of $500 and $700 with contrast. ← Previous Story Men & Women: Ask yourself these questions.